Over the last 24 hours the two red boats in the Volvo Ocean Race fleet have lifted off from the rest and are now engaged in a thrilling gybing battle right along the edge of the ice exclusion zone. Yes, it’s Dongfeng Race Team against our old friends on the Spanish boat MAPFRE skippered by Xabi Fernandez who are now dueling in the Southern Indian Ocean about 580 miles northwest of the windiest place on earth (the Kerguelen Islands). This feels like a critical moment not just in this leg but in the race overall as Charles Caudrelier and his team on the boat, with the double swallow motif of Dongfeng Motor Corporation on it sails, look to impose themselves on MAPFRE, having finished behind them in both of the opening legs. As the crews move steadily east on Leg 3, out of influence of the depression that has dominated the last few days and increasingly into the influence of a big high pressure system sitting to the west of the Great Australian Bight, we talk to Dongfeng Race Team meteorologist Marcel Van Triest about what’s coming next. It’s a fascinating contest that you can watch, blow-by-blow on the tracker as the two teams put into practice all the downwind speed techniques they developed when two-boat testing off the Spanish resort of Sanxenxo in the late summer. It is a battle taking place in big sea conditions – likened this morning by Martin Keruzore, the Onboard Reporter on Dongfeng, to racing in the Paris-Dakar rally – and watched by majestic albatrosses swooping low over the boats’ wakes. It is punctuated by gybing manoeuvres that have to be timed to perfection and bring with them the ever-present danger of damage to sails or rig. This morning the north-south separation between the two crews has been up to 30 nautical miles as the gybe slightly out of phase and cross. 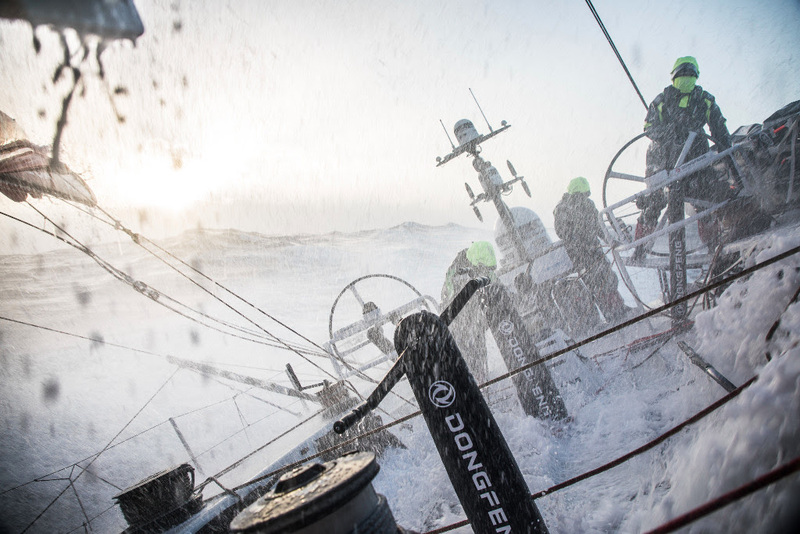 Right now Dongfeng has stretched her lead to nearly 16 miles, having pushed hard to open the gap that at one stage had fallen to less than two miles. The rest of the fleet is spread out to the northwest and to windward of the leading pair, with Vestas 11th Hour Racing in third place but now 101 miles behind and Team Brunel another 80 miles back in fourth place. Team AkzoNobel, which has incurred mast-track and mainsail damage as a result of a violent gybe, is now in last place nearly 300 miles behind Dongfeng and 305 miles to the northwest. At Dongfeng’s nav station the “distance to go” figure to the finish at Melbourne – where it’s summer, unlike the bitterly cold weather where the crews are right now – is hovering just under 3,880 miles.